The Urban Naturalist . . . Most wildflower books, including field guides, emphasize the meadows and woods of parks and wilderness spaces. Examining the literature more broadly and digging deeper, books that cover general nature study sometimes cover topics closer to home. 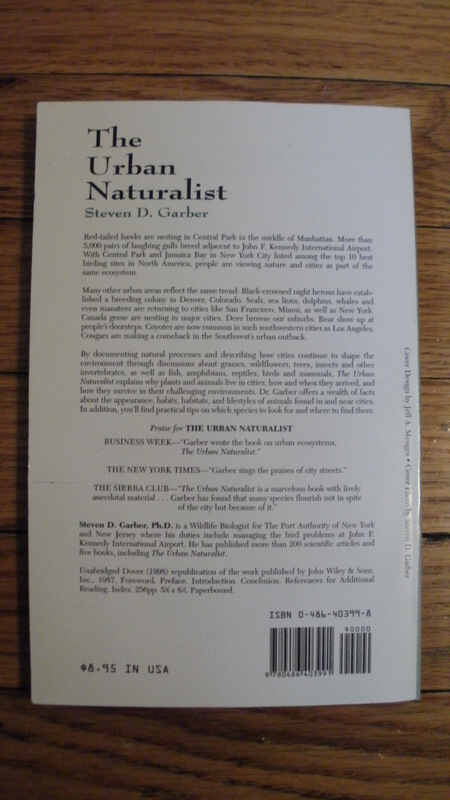 One example is The Urban Naturalist, authored by another writer with roots in New York: Steven D. Garber. Dr. Garber was educated at Cornell, New York University, and Rutgers. He has authored numerous papers and several books during his long career in environmental science. 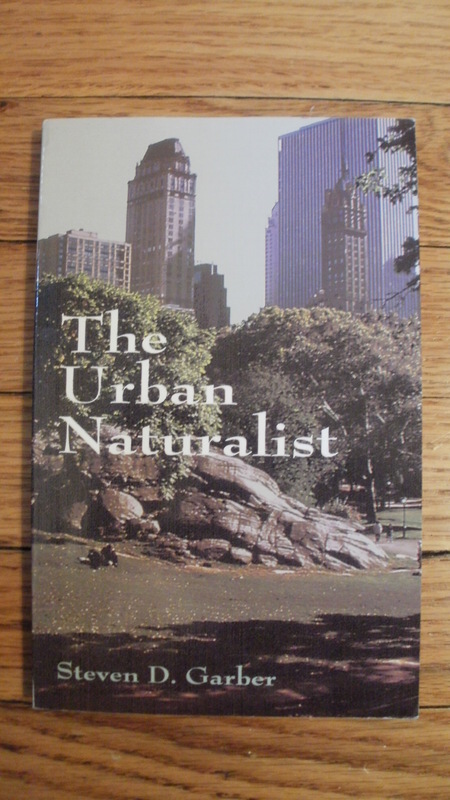 The Urban Naturalist was first published in 1987 by John Wiley and Sons, Inc. Garber was at that time a wildlife biologist for the Port Authority of New York and the region’s three major airports. The book was reprinted in 1998 by Dover Publications, Inc. This is the edition I own and use. Garber begins the book with an essay – “Urban Ecosystems” – that provides a valuable contribution to a less than fully understood facet of the environment. His thoughts illuminate subjects such as urban microclimates and invasive species. His prose style is informed by scientific writing and focuses on the subject matter, sans personal memoir. The chapters that follow are dedicated to different wildlife types: Grasses and Wildflowers; Trees; Insects and Other Invertebrates; Fish; Amphibians; Reptiles; Birds; and Mammals. The chapter on wildflowers of course interested my own research the most. 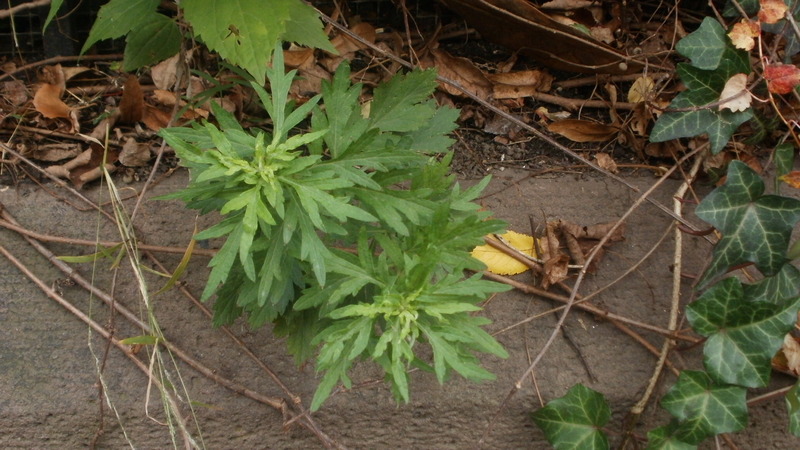 Garber’s selections are logical in the context of the urban environment and include Chicory, Mugwort, Plantain, Purslane, Clover, Purple Loosetrife, and Lamb’s Quarters. Line illustrations by Jerome Lo enhance the plant descriptions throughout. The book concludes with an expansive bibliography of books divided by the chapter subjects. This alone makes The Urban Naturalist an excellent resource for, you guessed it, the urban naturalist. Garber, Steven D., The Urban Naturalist, Dover Publications, Inc., Mineola, NY, 1998. There’s a field just across the road (a few empty lots, actually–and clay soil) and I have found over twenty-five different kinds of wildflower there. I was surprised! Think I would like to see this book. This is almost the 25th anniversary of ‘The Urban Naturalist’ a groundbreaking book about urban ecosystems, and especially about New York City’s ecosystem. I thought you might be interested in more background. Not too long ago I read an article in the New York Times that said High Line happened when instead of tearing down “the elevated freight tracks that cut through the West Side of Manhattan,” they were preserved and turned into a park. Here’s how the High Line started. In hundreds of speeches, interviews and articles I took every opportunity to get the idea out there, that that old highway could and should be turned into a park. For this to happen, NYC couldn’t tear the old highway down. When I couldn’t get Mayor Koch to support the idea, I persuaded the next mayoral candidate David Dinkins, not to tear it down and to support the idea of a park there in exchange for support the support that I delivered him with the endorsement of New York City’s Sierra Club. After Dinkins, I continued working with mayoral candidate Rudolph Giuliani. I wrote Giuliani’s environmental platform and got him to support the idea. He said all the right things, but did little more than stop plans to tear the elevated Westside Highway down. He was swayed by the developers who wanted to build on that land. I spoke with Donald Trump and convinced him how important it was to make the shoreline he owned on Manhattan’s West Side accessible to the City. After Mayor Giuliani was replaced, Mayor Michael Bloomberg allowed the idea to finally take hold, money was allocated, and the park became official. The New York Times said this park survived “so many moneyed interests [that] were united against saving the elevated freight tracks,” and finally what I modestly admit was a brilliant idea, after years of fighting, this vision came into fruition. Robert Hammond, said he thought the park “would be good for the local economy” but “we had no idea that it would happen this fast.” To Mr. Hammond, it seemed like the park happened fast. For me, it took decades to make this park happen and I see no reason to be shy about this, since the park would never have happened without my vision, my work, and my behind the scenes politicking. What I started is hailed as brilliant and visionary. Here’s proof I was there right from the start. In 1987, Marion Belcher wrote an article in the Clinton Community Press about my work. This was when the concept of urban ecology did not exist. People thought ecological processes only happened in the wild. That places where people lived didn’t really count. Now, books are written about urban ecology, entire journals are devoted to urban ecology, PhD programs, university departments, and the list goes on and on. Back then urban ecology was a non-sequitur. Even biologists laughed at what I was writing. But time proved me right. “Heading home, I feel like I spent the afternoon in the country, though I never left the… area; and I have a better appreciation for what Steve Garber means by ‘somewhere real.’ To quote Henry Stern, our [then] Parks Commissioner, from his forward to ‘The Urban Naturalist,’ ‘Preserving and improving our wild areas in New York City will provide an uplift for all of us. We’ve been neglecting the outdoor aspects of our sustenance. Without nature we are deprived–and New Yorkers don’t like being deprived of anything’” (Marion Belcher. Clinton’s Urban Naturalist. Clinton Community Press. Pages 3 and 5). I’m glad I’ve devoted my life to helping the natural world and to showing how nature is changing. It’s important to teach and preserve the history of nature.